By Christine Schmidt @newsbyschmidt Nov. 29, 2018, 11:04 a.m.
Unsurprisingly, policing ads on Facebook is easier said than done. News organizations have been trapped between Facebook’s rules for political advertisers and advertising for their own reporting — but now, Facebook will try pausing its requirement that media outlets as well as, well, actual political advertisers register with a representative’s home address and photo ID. The change begins in the U.K. and may roll out to other countries. The news came nestled in an announcement about beginning enforcement of political ad authorization/storage in the U.K. — good luck, Brits — where instead Facebook will “initially use UK member lists from a variety of established news industry groups to help inform which news organizations receive authorization exemptions,” Facebook’s director of product management Rob Leathern wrote. Eligible news publishers in the U.K. won’t be required to get authorized, nor will the politics-related stories that they pay to promote be collected in the Ad Library, unlike the current setup in the U.S. This is, as Facebook always likes to emphasize, a test and may be rolled out to the other countries (including the U.S.) over time. Since the initiative’s launch in May, many publishers bristled at these mandates or didn’t realize that they would be barred from boosting an article unless a staff member registered, until it was too late. We wrote about Orb Media’s struggle in September to promote a global investigation about younger generations’ political participation. 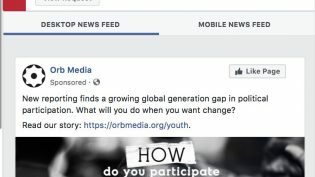 Orb was one of several organizations, including The Hechinger Report, Voices of Monterey Bay, Birmingham Watch, Stat, the Observer-Reporter in Pennsylvania, and First Look Media, that battled Facebook’s filter for trying to catch political ads and netting legitimate political/policy reporting in the process. Some news outlets, like New York Magazine and Reveal, decided to stop advertising stories that could be misconstrued as political content on Facebook because of the platform’s staunch requirements. We recently went through this @topicstories / @firstlookmedia. An account admin has to be personally verified first to get the page whitelisted, then each ad is taken on a case by case basis w/r/t to it being 'political' or not. The U.K. has been noticeably tough on Facebook’s advertising practices since the Cambridge Analytica scandal was uncovered in its own backyard. On Tuesday, Mark Zuckerberg was requested to appear before the country’s parliament alongside lawmakers from Canada, France, Belgium, Brazil, Ireland, Latvia, Argentina, and Singapore — but he sent the company’s VP of policy solutions instead. Facebook’s full announcement about the authorization changes and U.K. enforcement is here. Image based off of The Digital Artist used under a Creative Commons license. POSTED Nov. 29, 2018, 11:04 a.m.
Schmidt, Christine. "Facebook will try not requiring media outlets to register as political advertisers (at least in the UK)." Nieman Journalism Lab. Nieman Foundation for Journalism at Harvard, 29 Nov. 2018. Web. 25 Apr. 2019. Schmidt, Christine. 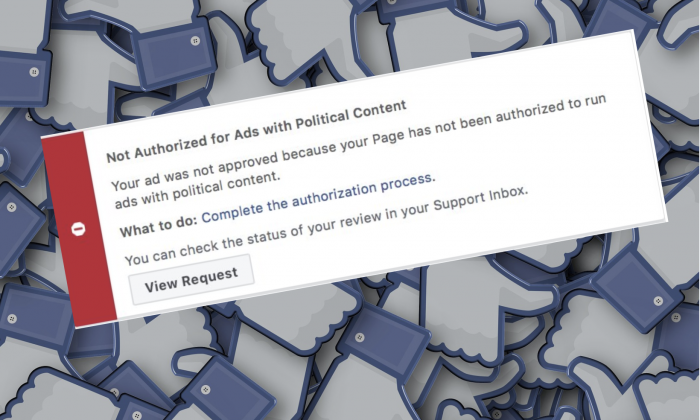 "Facebook will try not requiring media outlets to register as political advertisers (at least in the UK)." Nieman Journalism Lab. Last modified November 29, 2018. Accessed April 25, 2019. https://www.niemanlab.org/2018/11/facebook-will-try-not-requiring-media-outlets-to-register-as-political-advertisers-at-least-in-the-uk/.